TLoZ: Black Crown (BC) is an offline hack and slash RPG, best compared to a mix of Diablo and Zelda. In BC you hunt for the best items, steadily improving your stats and talents. A lot of Zelda fan games seem to follow formulas established in the official games. There's strong story, you have to save whatever land you're in, you get items, so on and so forth; few diverge from this tried and true path. However, it tends to be the ones that do that are the ones worth keeping an eye on. Tikta's "The Legend of Zelda: Black Crown" is one of those games; taking cues from roguelikes, Black Crown allows full customization of Link's growth, whether it's stats, talents, or even equipment. Though it originated several years ago, Black Crown is back and better than ever, and this is why it's our new Featured Project. 1. So first, from the development pov. What made you choose C# and XNA for this project rather than something simpler like GM? Has that choice hindered your development at all? Since a young child I've had a large interest in computers and programming. It all started with Text Adventure Games in QBasic on my father's 33 MHz PC. The 'logical' next step was C++, which I learned by creating a set of games including a Mario-style jump'n run. I actually didn't know about tools like GM. Bare-Metal is the most fun for me. Even engines like Unity3D can bore me on how they do so much work for you. Moving from C++ to C# was a huge productivity boost. Right now I am considering on ditching XNA for MonoGame. But it is a lot of work. If you want to start a similar project I encourage you to jump straight into MonoGame. If you are trying to decide whether you should go and use an existing game creation toolkit or roll your own, then you should keep in mind that your e.g. GameMaker skills are most likely not that relevant in the professional work world. But it's still a fine tool for game creation and I don't want to bash it. You will be able to apply many of your GM scripting skills onto bare-metal projects! 2. You are also using FMod for audio. Why not just use XNA for that as well? The main factor was that I wasn't yet using XNA when I decided to go for FMOD. 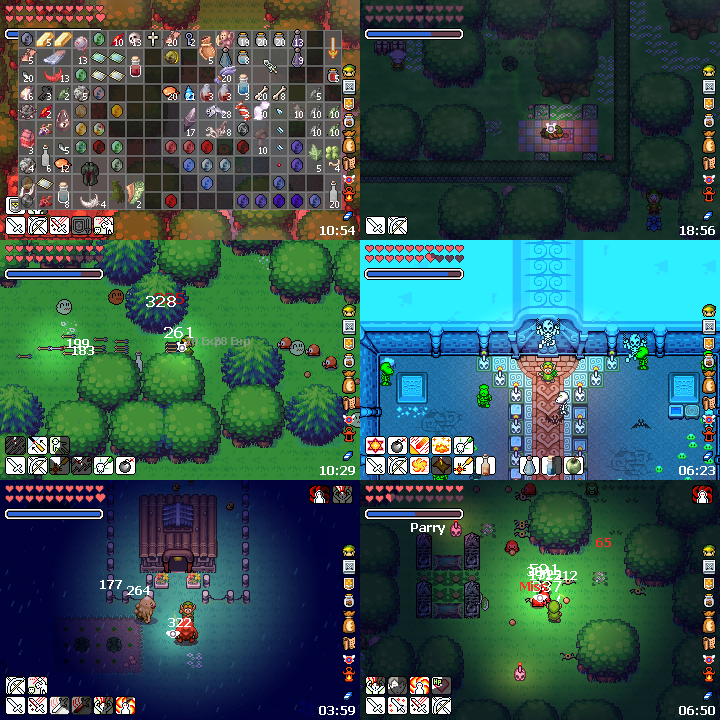 Also FMOD is used by large game studios around the world and as such has many features and is quite stable. I've had to write my own C# wrapper (Atom.Fmod.dll) to make it more user friendly. 3. This game clearly has a dark theme to it. In what way does this relate to the story? You are right. Monsters are invading all of Hyrule. Most NPCs are depressed and it's raining blood! No one is safe. To be honest.. the story is still one of the weakest parts of the game. While there is a thin story thread that leads the player through the game, but I still want to improve on it. But I have started to create the foundations for story-telling with technology like the "chat bubbles" over characters. 4. The leveling up system is interesting and unique to Zelda. In what ways can we expect to see the player grow over the course of the game? On every level-up you gain status points and talent points that you can freely invest. There are no class restriction and you can make up your own build. Pure build usually go into one Main talent tree and the support tree. Other builds such as DaggerLink (Rogue) require you go hybrid with Melee, Ranged and Support. Improving your equipment by finding rare good-quality items, crafting items and placing the right gems into gem sockets is another very important part. If you plan your talent and stat allocations and have some luck you’ll develop Link into a force to be reckoned with. 5. That flame attack in the trailer looks pretty vicious! Are attacks like this always this powerful from the start, or does the player have to power it up as part of the level up system? Uff, that's a challenge. *grins* It's a lot of work to fill huge maps with content. But I am trying! The game engine allows relatively large maps with many monsters in them. Another important part of the game is exploration. There are quite a few hidden corners and extras. Including some Metroidvanian elements that require you to return to an already explored location after finding a specific item and/or Ocarina Song. You gain experience by killing monsters or completing quests. When you gain a level-up you get both stat points, investable in the 6 main stats (Strength, Dexterity, Agility, Vitality, Intelligence and Luck), and talent points. Talent points may be invested to further specialize your character! Do you want to be a fast-attacking melee fighter that often crits? Or a straight up archer? There are many ways in which you can invest your talent points to create new and fun characters. Items come in different types and qualities, from Common to Rare, Epic or even Legendary. Some of the best items may be crafted using the Magical Crafting Bottle. Don't forget to use the Zelda Updater after installing the game to get the latest patch. This page was last modified on 1 July 2013, at 12:17.